Most everyone knows the nutrition benefits of eating oats but I wonder how many of you know what is involved in their process. If interested, read on! Cleaning is the first step in the processing of oats. This is done to remove stones, other grains, chaff, weeds, etc. from the raw oats. Even lightweight oats are removed by air aspirators and are used as fodder for animals. During this process, oats of various sizes are separated by different machines. The cleaned raw oats are fed to a large machine, which throws the grains to an outer rubber ring. The impact of the collision of the grains with the ring, causes the separation of the hull from the kernel called groat. Then the hull is removed using air aspirators and is used as feed for livestock or to produce oat fiber. The resultant groats are further cleaned by the scouring machines. Next step is heating of groats. Raw oats contain lipolytic enzymes, which break down the fat in the grain to free fatty acids, which in turn changes its flavor to rancid. In order to avoid this, cleaned groats are subjected to heating by dry heat radiators in a kiln. After heating to a temperature of 215 degree Fahrenheit, the steam produced by the heat inactivate the lipolytic enzymes. This process is unavoidable, because after de-hulling, the flavor of groats will change to rancid within four days, unless stabilized by the above said process. This treatment also gives a nutty flavor to the oats. The next steps are the final processing ones. Each process gives a different edible product made of oats. The groats are fed to sizing systems, where machines separate the groats as per their size. After separating the large groats, the small groats and the broken pieces are directed to the cutting system. Here the steel cut oats are made from the small groats and broken pieces. Sifters are used to sort out small and large pieces. Small pieces are called baby steel cut, while large pieces are referred to as large pieces. A mixture of both is termed as regular steel cut. 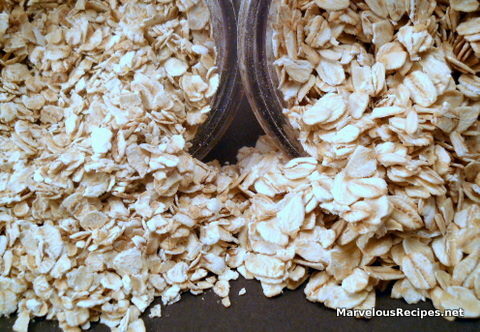 In case of shortage of broken pieces, whole oats are cut into required sizes by steel blades. This process results in the production of oat flakes or rolled oats, depending upon the raw material used – groats or steel cut oats. This raw material is steamed and then passed to the rolling mill, which is usually, two large rolls spinning at the same speed in opposite direction. Large steel cut produces quick and thick quick rolled oats, whereas baby steel cut produces baby flakes. Whole groats produce old-fashioned types like regular, medium and thick-rolled oats. Before packaging, a bed dryer is employed to dry the flakes to 11% moisture. The milling process involves two methods. One is oat bran milling and the other is whole flour milling. In the first method, oat groats are send through roll stands, which separates the bran from the flour. This process results in two products – oat bran and oat flour without bran. The second method is used exclusively to produce oat flour from whole groats. Groats are fed to hammer mills, where it is converted into fine oat flour. The coarse flour, left behind after sifting is again fed to the hammer mill and this process continues. Now you know the processing methods behind the various forms of edible oats available in the market. It is said that groats and steel cut varieties are more nutritious than the rolled ones, as they are not processed further. Oats are also considered a rich source of carbohydrates, proteins, vitamins, minerals and dietary fiber. So, including oats in your breakfast can definitely add to the nutrition value as well as positively impact your health. Wow, This is quite a process. A very interesting read. I love oatmeal everything. Cereal, cookies etc. thanks for the info Emily.